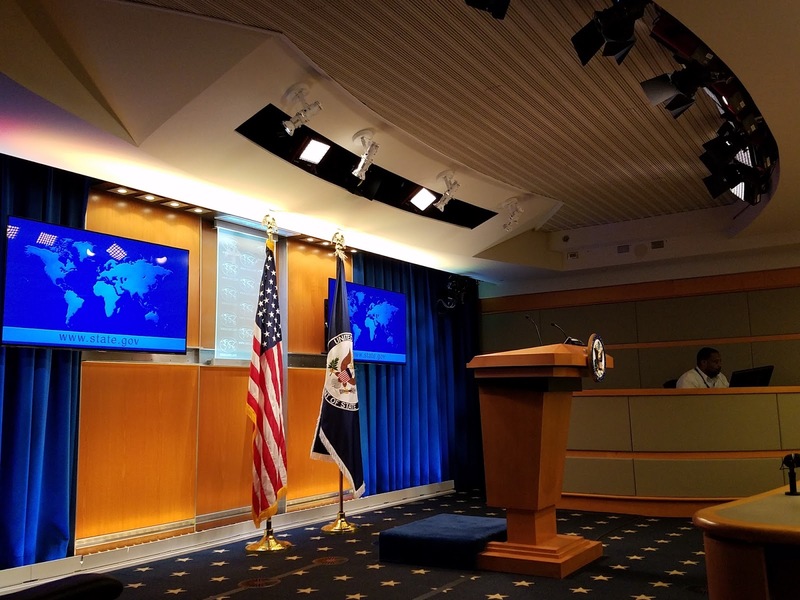 When it was time to update the aging lighting system for State Department's press briefing room Barbizon Lighting Company's Washington DC offices was charged with upgrading the system to new LED-based lighting. The new lighting design scheme consisted of Fiilex T360-PRO Plus units for key lighting, Cineo MAV-X remote phosphor fixtures for fill. Back and area lighting was accomplished with a mixture of Cineo MAV-X and ETC D22 units. ETC S4-MINI and Color Kinetics Purestyle Intellihue linear units were used for architectural highlight and uplight for the rear wall. The new look is clean and contemporary, and can easily be controlled by Electronic Theatre Control's Nomad Puck™ mini-computer running EOS software.